The waters of Cadiz bay are naturally sheltered and enclosed despite facing directly into the greatness of the Atlantic Ocean. This combined with the fabulous weather that this part of Andalusia enjoys throughout the year makes this bright and historical bay a great spot for water sports. 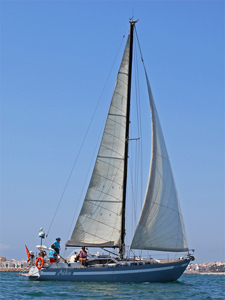 This 4h sailing tour will take us on an elegant 12m sailboat along Cadiz bay from the sweet little port of El Puerto de Santa María, to where we will be driving from your accommodation. On the boat we will meet a lovely couple of welcoming and experienced local sailors who will take care of us along the journey. We will learn about the particularities of the different winds that blow in this area and how much influence they have on people’s mood, character and lifestyle. 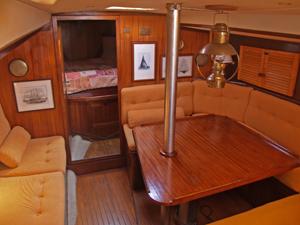 The boat has a comfortable outdoors seating area as well as plenty of flat surfaces to sunbathe, relax and enjoy the wonderful views. You will be able to see from a unique perspective a coastline featuring a series of sandy beaches, small towns, marshes, ancient salt industries and a beautiful natural park where many birds stop over on their migrations. Inside there is a large and homely sitting area, a kitchen and a toilet. Our hosts on the boat will offer us a drink and something to eat during the trip as well as the possibility to stop for a swim in the middle of the ocean. Once back in the port of El Puerto de Santa María and before driving back to your accommodation, we will go for lunch to a wonderful local restaurant in town to taste the excellent gastronomy of the area, mostly based on fresh fish and vegetables. This day trip is ideal for people visiting South West Andalusia wishing to take a sailing tour in its gorgeous Atlantic coast. It includes private transportation in a modern and comfortable vehicle with A/C from your accommodation to the port and back. Your personal guide and driver will pick you up in the morning and will drive you back in the late afternoon after spending a great day together sailing along Cadiz bay and tasting its local gastronomy. Prices: start at 95 Euros per person (incl. VAT) for a group of 8 people. Includes: private guide and driver throughout the day and sailing trip.